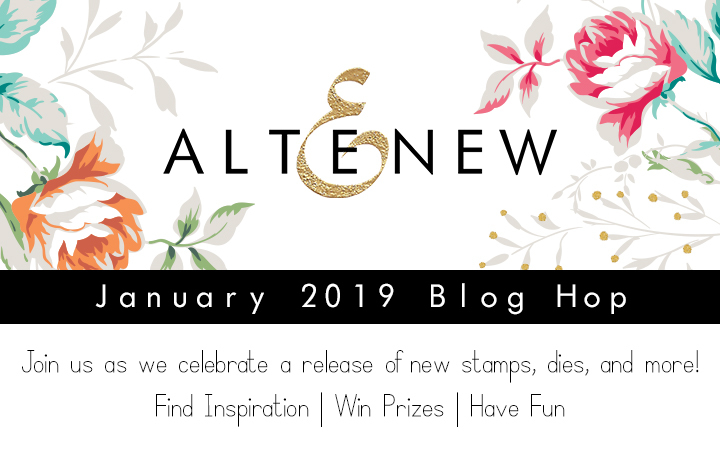 Welcome to the Altenew January Stamp, Die and Stencil Release. If you have hopped over from Olga Moss's you are right on track. You can start the hop on the Altenew Card Blog. This release is such a fun release. I really loved using the different stamps and dies. I created a layout and a card for my blog. For my layout I paired the Aquarius Die and the All The Hearts Stamp set. First I used the All the Hearts Stamp to create a background on some 8,5x11 smooth cardstock. I matted it onto some darker cardstock that had the same shade as the darkest ink colour that I used to stamp the hearts (Lagoon Crisp Ink). I matted the background onto some white cardstock and added some patterned paper to the left hand side to balance out the colours. This patterned paper was also used to frame my photo. I cut out some elements from a patterned paper from the Reflection Scrapbook Collection and added the word AQUARIUS which I cut out of some Altenew Gold Cardstock. To add some contrast I used sentiments and stamped them in a triangle. A wood veneer element adds the final touch. For my card I combined the Fancy Frames Stamp set with one my older sets which I hadn't used yet: Get Well Soon Stamp set. First I stamped three doily shapes. One large one and two smaller ones. I cut them out with the coordinating dies. 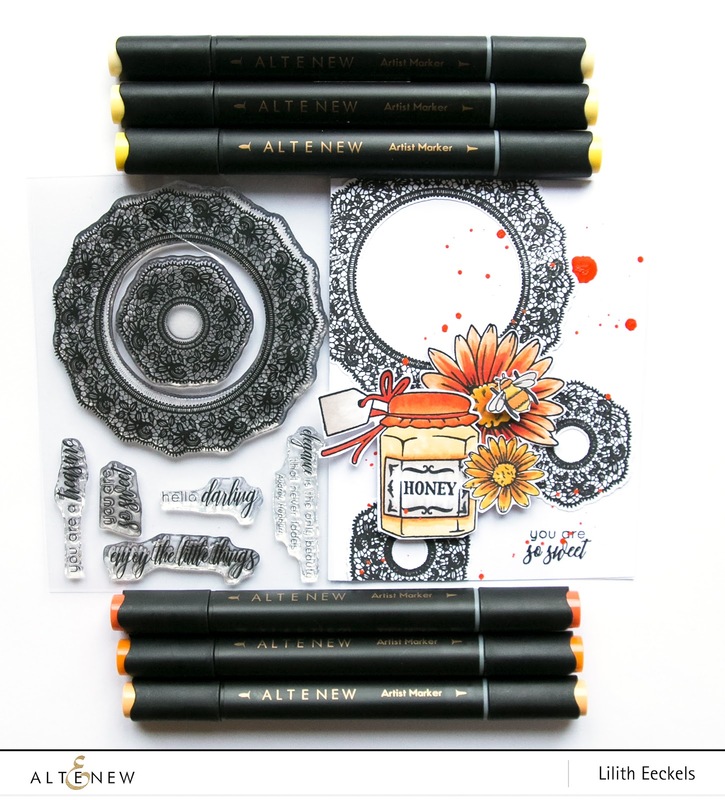 The I stamped the honey pot and flowers and coloured them with Artist Markers from sets B and E. I was a little impatient and didn't wait long enough for the permanent ink to dry so in some places the black ink did smudge a little. Then I placed all the elements on a card base and added a sentiment. You can see how I created the card in the video below or watch it in HD on YouTube. To celebrate this release, Altenew is giving away a $50 gift certificate to 6 lucky winners! Please leave a comment on the Altenew Card Blog and/or Altenew Scrapbook Blog by 12/31/2018 for a chance to win. 6 winners will be announced on the Altenew blogs on 2/3/2019. I'm giving away a 30$ gift voucher to the Altenew Store. Leave a comment here and I'll pick a winner on January 30th. Thanks for sharing your talent! love this release. Such a beautiful layout. I love the colors, so pretty. Very creative and pretty projects! Another beautiful layout, I love the teal and white paired with the pictures. I also must tell you how I inspired I was by your craftroom tour the other day Lilith. Thanks for all you share. You did an amazing job today ! This new release is a budget bender ! Bee-utiful card! Love the honeybee with the pretty flower and fancy frame! Your layout is so lovely! Thank you for sharing your talent, and inspiring. Your projects are beautiful. I love all the colors. I'm loving this new release from Altenew. I am absolutely crazy about this stunning release! Love the beautiful flower stamp sets, and especially the Garden Picks 3D dies. Your projects are amazing! Such pretty designs. I love the big background with pop of color on the second one!!! Beautiful projects! The color palettes are so inviting - cool blue and warm honey - what more could you want? Lovely! I love the colors in your layout. It's so soft and peaceful. Simply gorgeous! 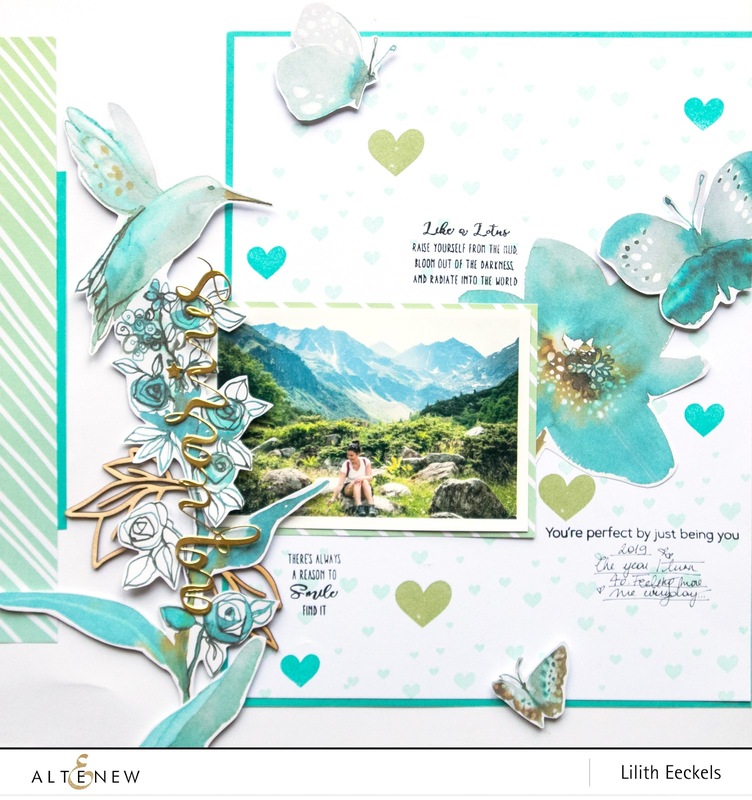 Beautiful layout - I love the teal you used; the simple colour palette is so fresh and lovely! Beautiful layout as always! I love how the colors coordinate so well and the focus is never lost on the title and image. I love the way the honey pops on the card. Every time I think I have enough flower stamp sets, along comes a release like this one! Thanks for posting a scrapbook layout. We don't see enough of those. Really love the colors you used on your layout, just gorgeous. I LOVE your color selection! Black and white with a punchy color! It is a very clean card with a touch of jazz! Very nice! 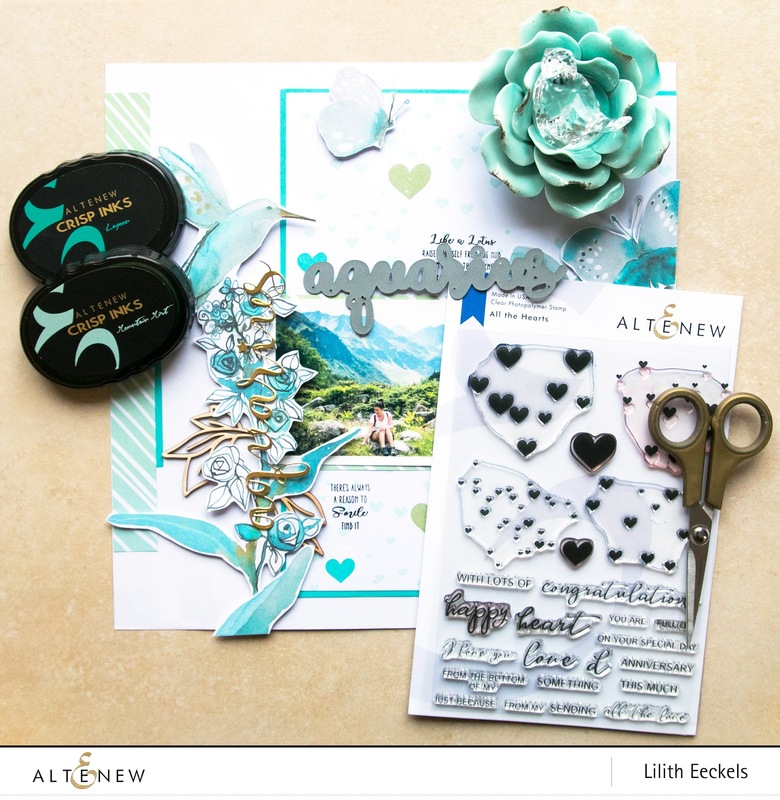 Love your layout love the aqua color and layering of stamp- just beautiful! Very pretty projects. Great release! 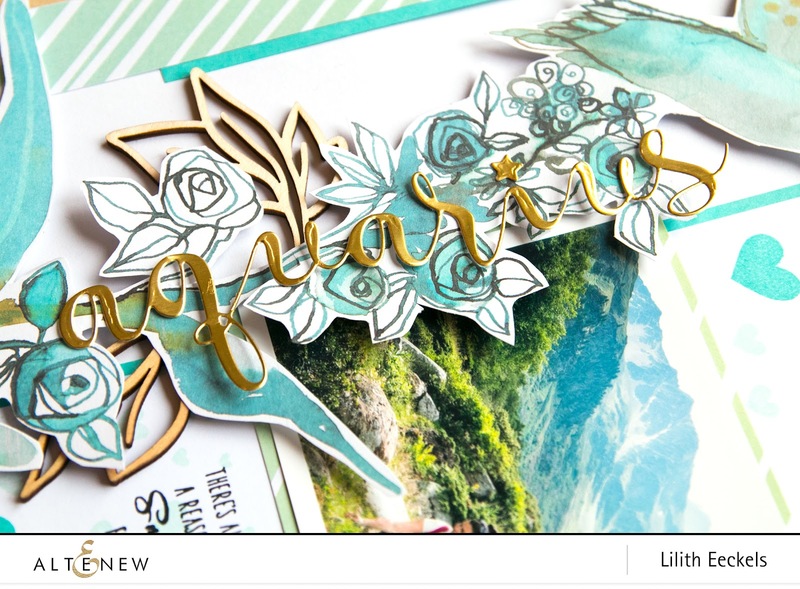 Love your layout and the aqua color - love how you layered the stamp/die - Beautiful! Lilith you LO is amazing, love the color palette and all the elements you added, the triangle of sentiments certainly helps focus on the image. Love the pop of color on your card too, it makes the jar pop! Thanks for the inspiration and for all that you share! Beautiful work...thank you so much for sharing these pretty samples....great new release! So lovely! The colours are wonderful. Your pages and cards are unique and beautiful. I wish you lived near for a class. beautiful products and projects. thanks as always for sharing. Simply stunning! Your work is so creative! These are amazing, Lilith! Love the flowers, bird and butterflies. The honey jar is too cute!! Amazing cards. Can't get over how pretty the aqua shades on the card look. The honey jar is so cute. Love the cards. Lovely projects! The turquoise/teal colors look so pretty . Also, I have the set with the honey & love the idea of framing it with the new doily frames set. Stunning projects ~ Love the bright colors! Gorgeous layout! Love the colors and layers...and the beautiful flowers! A feast for the eyes. Your card rocks! Thanks for the inspiration today! Gorgeous projects; your layout is stunning! That layout is just so pretty! I love all the blues! Wow Lilith! 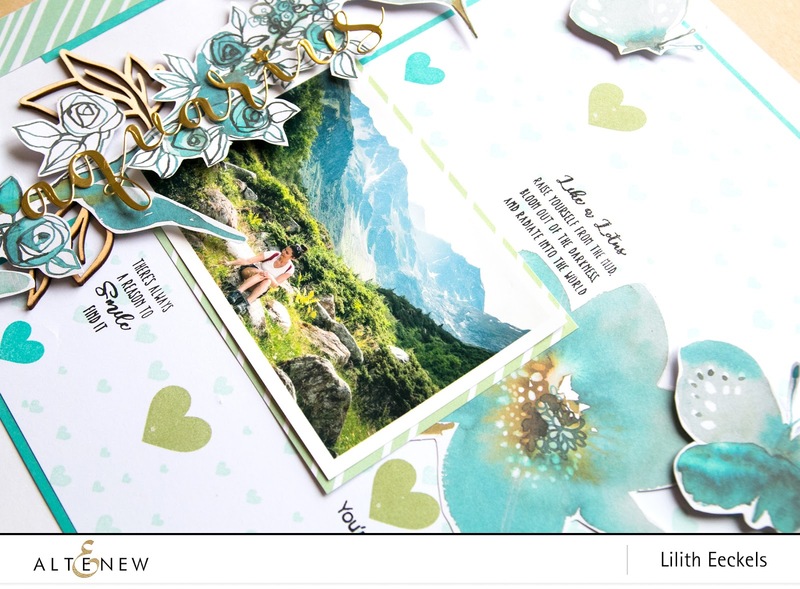 Your layout is ethereal and your card is 100% pure sweetness :) Thanks for sharing! Beautiful page and card, love all the flowers and wonderful designs! Beautiful layout and card! I LOVE the colors! Your scrapbook layout is gorgeous. I love the teals and greens you used to create it. Thanks for the inspiration. Your card and layout are just gorgeous! Thanks so much for sharing and inspiring us! I love the colors on your scrapbook page. Beautiful! Your layout is amazing! I love the how all the colors for the elements are pulled perfectly from the picture. It is so serene and conveys the emotion beautifully. Love the pretty layout and your card is so unique. Thanks for the video! Love your layout and the card! Awesome Release! Great projects, I especially love the beautiful blue layout, so many wonderful elements! Absolutely stunning ideas. Thank you for sharing these. These are lovely! I really love the use of golden accents on your layout - it looks beautiful! I just love your style. The colors in your layout are delicious. And all the B/W on your card is the best backdrop for that sweet bee. Gorgepus flower on your layout! And a pretty card too! I absolutely love your layout! Really great colors. Beautiful layout and card! Lovely job. Thanks for sharing! love how you coordinated your photo colors with the patterned paper to create your wonderful layout! Love the use of the heart stamp set. Great layout on the page. This is such a cute card Lilith and I would love to have your recipe for your cleaner. Your layout is beautiful and seeing how you used colours that you pulled from the picture really makes me want to scrapbook again. (I always did that as well but I have so much more to work with now that it would be fun to incorporate more stamps and inks to a pagelayout.) TFS! Your layout is amazing! Love how you combined all of the elements. Great job! But your card stole my heart. Not sure why, but it did. I love the Fancy Frames Stamp set. I am anxious to try it. Gorgeous layout. And the card is very pretty and unusual. Great layout and yummy card, thanks for sharing! Love the layout and card...both are eye-catching! Thanks for the video which always helps. I love these pretty teals! Your color combinations are just gorgeous! Gorgeous layout, I love the teal green and gold elements together and your card with the lacy design is beautiful too. 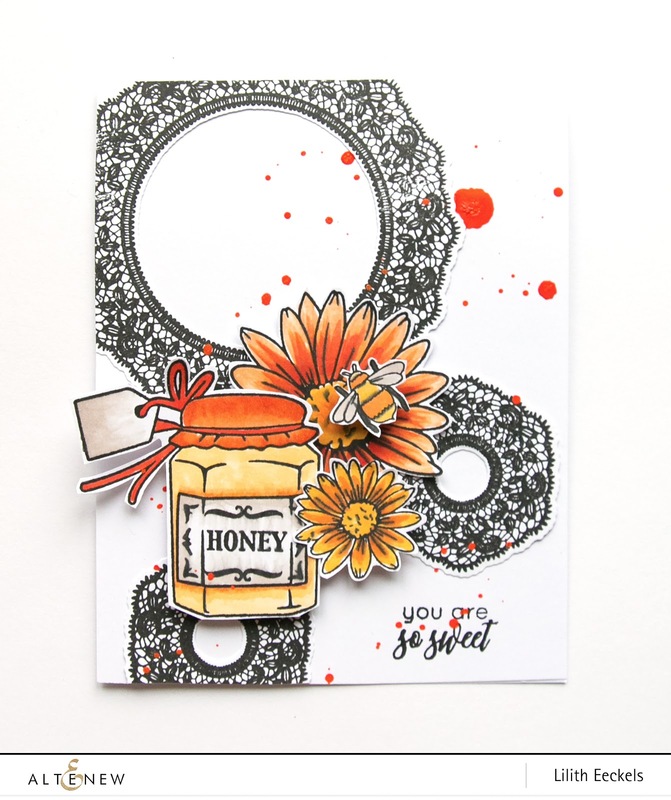 wonderful colors on the layout and love the doilies on the honey card. Love the way the blues in your layout reflect the blue in your photo! I love the peaceful colors you chose for your layout and the way you designed it! Beautiful! I also liked the happiness of your card! So cute! Thanks for the inspiration! Your layout is gorgeous with the teal colors! I love the hummingbird!! It is just spectacular!! 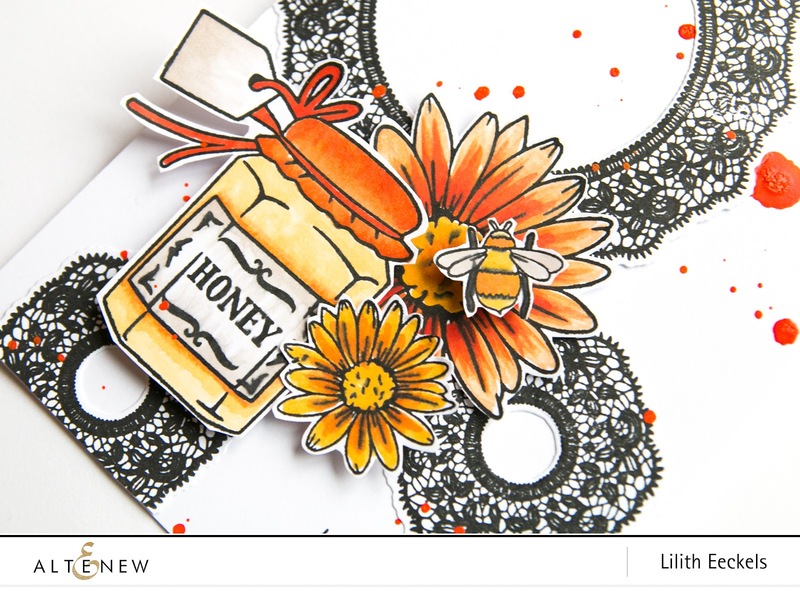 The honey layout is fabulous as well! Your scrapbook page is just beautiful! Thank you for sharing your work. 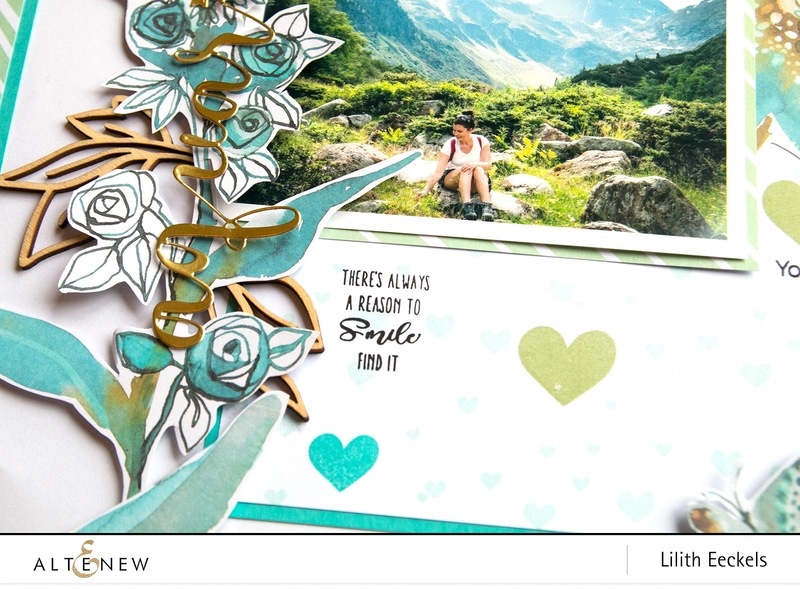 love your card and scrapbook page! Thank you for sharing your talent! So pretty!!! Your honey and bee card is so so awesome. I love the layers you used and there is so much detail that goes together perfectly. I love the colors too. Love that gorgeous page. Beautiful blues, unique style -- beautiful. Well that layout is just beautiful!! You've matched the ink colors perfectly to the picture colors!! I also love the design & colors on your card! Your layout and card are wonderful. Outstanding. These are so very pretty! Love the blues in the Aquarius layout! Your layout is absolutely gorgeous! I love the blues you used! Also the card is gorgeous! The honey jar and flowers stand out so beautifully on the black and white background! Thanks for all the great inspiration! Amazing layout in my favourite colour! I also love the card so cute! Love the simple colors: white + shades of one accent color. So elegant! just luv those colors on your layout! Such pretty designs...and very creative!! I love those doilies and your card is sure to cheer for anyone who needs a pick me up!! Beautiful layout pages and card! Love the Fancy Frames set you used on your card! Lovely card and layout. I especially love your color choices on your layout, those are some of my favorites too. TFS! Beautiful layout. So tranquil!! Thanks for sharing! Great layout and card. The soft colors in the layout are just beautiful. And the bold orange on the card is perfect. Love your artwork. I love how you created a page with the word Aquarius but it didn't have any stars in it--it is a beautiful page! Your sense of color is beautiful Lilith and I am blown away by your first mountain layout - gorgeous use of the new Altenew products! As always your projects are absolutely amazing. Beautifully designed, balanced and executed - WOW! Lovely card and layout! It was nice to see a card using the fancy frames. It's such a large release and I haven't seen much of the doily frames; they're very pretty. 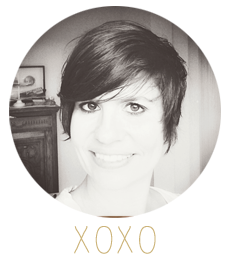 Love your card and your layout was stunning! thanks for sharing! Your layout is stunning for that beautiful scene! Love that pretty card, too! Fab palettes on this card and layout. The doilies are one of my faves from this release and you've showcased them beautifully. Beautiful card and layout. I love the colors of both. It was also nice to see that you used the lace stamps, they are so pretty. Your layout is amazing! LOVE the gorgeous colors you used & your card is also beautiful! Thanks for the awesome inspiration! Love all your projects as always they are awesome! Lilith, these creations are just gorgeous! Beautiful art, from a beautiful new release. Thank you for sharing! Like the soft look for your layout.